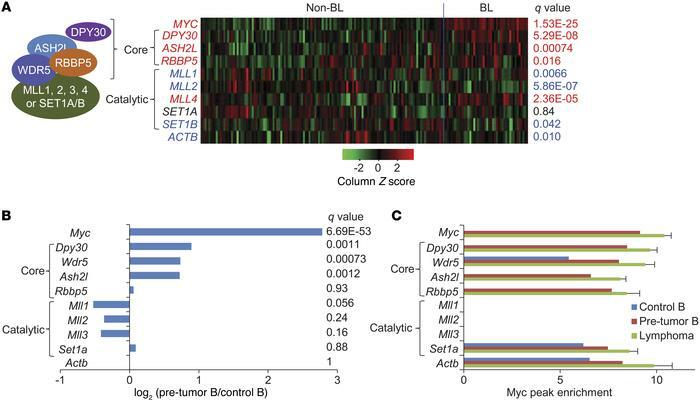 MYC directly promotes the expression of core subunits in SET1-MLL complexes. (A) Expression of SET1-MLL complex subunits in 44 primary human BL samples versus 129 non-BL samples from GEO GSE4475. Each column represents a sample, and each row represents the indicated gene. Genes in red indicate increased expression in BL, and genes in blue indicate decreased expression in BL. q values (FDRs) of the expression changes between non-BL and BL samples are listed on the right. The color key at the bottom reflects the expression level. (B and C) Analyses of data from Eμ-Myc mice from GEO GSE51011. (B) Expression changes of SET1-MLL complex subunits from nontransgenic control B cells to pretumor B cells in young Eμ-Myc mice. q values (FDRs) of the expression changes between 4 pretumor and 4 control samples are listed on the right. (C) Myc binding to genes encoding the SET1-MLLcomplex subunits in the indicated samples, shown by Myc ChIP signal peak enrichment values (mean ± SD) at the promoters of the indicated genes from 1 control, 1 pretumor, and 3 tumor samples.